Maybe you've heard people talk about dental implants. It's been said that they're modern dentistry's best option for replacing missing teeth; That they offer the highest success rate of any tooth replacement procedure; That, with proper care, they can last just as long as your own natural teeth — a lifetime. But, you may still be wondering: What exactly are dental implants? We're glad you asked! Picture a tooth — the kind you might see on an old-fashioned dentist's sign. It has two main parts: The crown (the pearly-white part that shows up when you smile), and the root, the part below the gum line that anchors the tooth in the jaw. A dental implant permanently replaces the root part of the tooth with a special metal insert that's placed in the jawbone with minor surgery. A crown restoration — that is, a prosthetic tooth that's created to look and function just like your natural teeth — is then placed atop the implant. 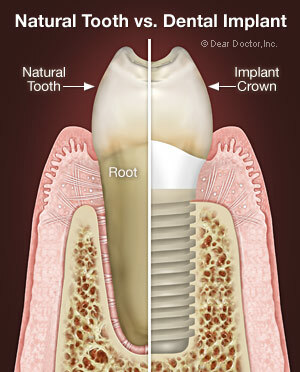 Together, they make an implant a complete tooth replacement system. What's so great about this system? Essentially, it's the fact that the titanium metal of which the implant is made has a very special property: It can integrate (fuse) with the living bone of your jaw, a process called osseo-integration. That's what allows an implant that has been properly placed to remain looking good and functioning well for a long, long time. And isn't that what everyone wants from their teeth?